With oil prices at a three-year high, Citi analysts highlight 5 top signposts that investors may want to keep an eye on. Citi's view is that oil prices may weaken into 2H18 as producer cuts come to an end. The level of oil supply disruptions: The risk is likely skewed to the upside for global oil supply disruptions given that OPEC's Iran, Iraq, Libya, Nigeria, and Venezuela pose a high short-term oil supply risk. Global Manufacturing PMIs: Citi's industry weighted average of global PMIs is at its highest level since 1H11 and if the strength in manufacturing PMIs persists then this is likely to remain supportive for crude markets. US oil rig count and US crude production: Higher US oil rig count could trigger investor outflows, as it has done previously, and this is expected in the next month. 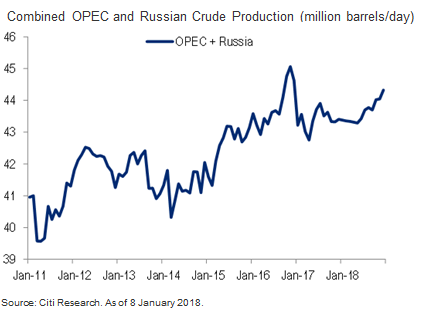 Citi analysts also expect US crude production to grow at ~1-m b/d y/y in 2018. Oil output cut extension deal: In November 2017, OPEC and Russia agreed to extend oil output cuts until December 2018 but all eyes will be on the June review which could result in early termination of the deal. On the potentially bullish side is the upside risk of supply disruptions, strong Chinese crude buying and stronger macroeconomic data that are supporting global asset prices and keeping sentiment bullish. On the bearish side is growing US crude production and rig counts, as well as potentially higher OPEC crude exports. Taking all that into consideration, Citi analysts think that oil prices could weaken into 2H18.